You are what you eat. What food has to say about a culture… – Ms.M.L.S.K.A. Mochi.Sticky rice cake.At first glance, it looks like a plain, off-white, but surprisingly smooth and symmetrical ball of dough.However, this dull impression does nothing but conceal the significance and intricacy that is engrained in the glutinous rice that forms this traditional Japanese delicacy. Traditionally, mochi is made for the New Year, Oshogatsu.As simple as mochi may appear, the traditional process of making mochi, or mochi tsuki, is actually a quite laborious undertaking that involves the extended family or church community.Special rice is soaked overnight and steamed before it is put into an usu (a large stone or wooden mortar)and then pounded with a kine (a large wooden mallet) swung repeatedly with force in overhead strokes. For those families who no longer practice mochi tsuki, confectionaries that sell traditional Japanese sweets, or wagashi, cater to their needs.One such shop, Fugetsu-Do, the oldest store in Little Tokyo at 103 years old, continues the tradition. 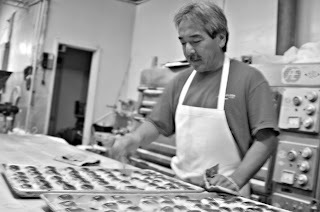 “One of the big reasons that Fugetsu-Do is still around is because [mochi] is so deeply rooted in our culture,” says Brian Kito, the current owner and grandson of the original owner.However, mochi for special occasions brings in only a sporadic flow of customers, so Fugetsu-Do, like other confectionaries, creates a variety of mochi to be enjoyed year round. As the culture changes, so too must the treats.Some creations, like manju (rice cakes filled with sweet beans), appeal mainly to more traditional pallets.But for other tastes, Kito has to be more inventive and takes a page out of the American cookbook with peanut butter mochi.This strawberry mochi with a peanut butter filling is reminiscent of a peanut butter jelly sandwich.“For a non-Asian mind, it’s something to relate to” says Kito, but also notes “that it’s only a fashion” that helps the business survive. Kito’s Fugetsu-Do is not the only confectionary shop reaching out to new tastes and customers.Nearby in Little Tokyo is another confectionary and inventor of the increasingly popular mochi ice cream, Mikawaya. On the other hand, the ways of eating mochi are evolving within the surrounding culture and may even soon take its own place in American culture.In the future, Hashimoto sees her mochi ice cream as less of a novelty and more of a staple.“Ultimately, I’d like to have people look at it as a desert item,” says Hashimoto. We can learn a lot about a culture through its food.We can use food to gain insight of a culture, its traditions, and where that culture is headed.Such is the case with mochi and Japanese in America.Who would have thought that such a plain, dull, looking rice cake could hold so much? Do you know where one can find an Usu and Kine? Do you know where I can fine an Usu or Kine?